When you come across discussions of data analysis and evaluation, you might think: ah yes, a worthy pursuit in a perfect world. And, in the wake of this thought, rushes another one: these are complex and technical tasks that my organization has neither time, funds, nor expertise to pursue. And so the thought dissipates, and you return to the tasks at the top of your to-do list. 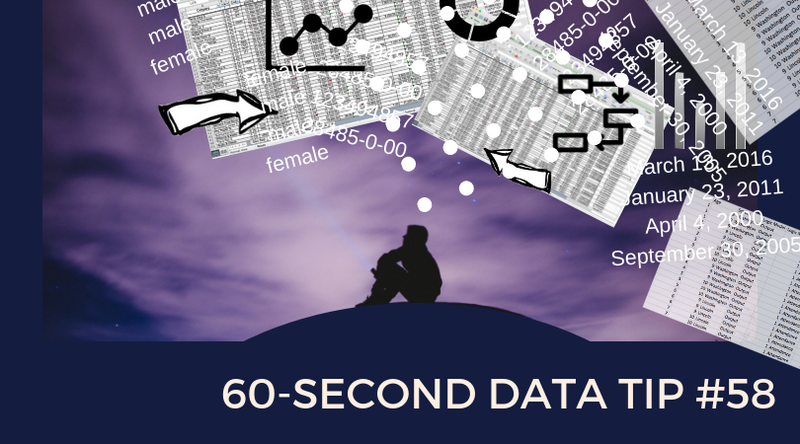 These 60-Second Data Tips are about demystifying data analysis so that you can evaluate and improve your work easily and regularly. We’ve talked a lot about how to transform data into images (aka data visualizations) to make your data more digestible and useful. The best data visualizations are like mirrors that you can pass by each day to get a quick picture of how you’re looking. “We” can be all of your participants, visitors, funders, etc. But you should also look at subgroups of these groups, for example those in certain age ranges or those who have been in the program for different lengths of time. And to understand how well you are doing, compare your work to something else: some type of standard or goal, other organizations in your field, or your past performance. A simple line chart showing change over time on a given measure will help you to compare your current performance to the past. A reference line showing a goal will help you to compare your performance to a standard. And, if you can get data from other organizations, you can plot their trends alongside your organization’s. Answering the question “how are we doing?” from a number of different angles will give you a clear picture and will help you to focus on where change is needed and where to stay the course. Pretty simple.